At Scuba Center we've been teaching scuba diving classes since 1973. We were Minnesota's first PADI 5 Star Training Facility and have grown to become Minnesota's largest scuba diving school. Scuba Center offers a complete range of PADI scuba diving training classes from Beginning (Open Water Diver) to Advanced Open Water, Rescue Diver, Specialty Diving courses, Emergency First Response (EFR, Nitrox, Divemaster, and the PADI Instructor Development Course (IDC). To keep your scuba diving skills sharp we offer Scuba Review and Diamond Reef Buoyancy classes for certified divers. 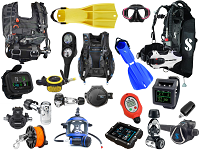 Scuba Center is an authorized dealer for most of the major brands of scuba diving and snorkeling equipment. When you purchase your equipment from Scuba Center, you will be receiving the Full Manufacturers Warranty... No games, No gimmicks. Our staff of certified diving professionals are here to assist you. We dive what we sell and share your passion for scuba diving and snorkeling. Scuba Center has a huge selection of quality scuba diving and snorkeling equipment, wetsuits, drysuits, and accessories. We feature great equipment from the best manufacturers, at great prices. Our Eagan Scuba Center, located just minutes from the Mall of America, features a 12 ft deep in store pool heated to a tropical 88 degrees, two classrooms, a full line of scuba & snorkeling equipment, Technical Diving gear, Rebreathers, Nitrox fills, and our Public Safety Department.